How many solar panels do you need? Take a look at your electricity bill. How many solar panels do you need to power a house? While most homes in the US need about 20 solar panels to cover their entire electric bill, that number can range anywhere from 8 to over 50. Why such a big difference? First off, the more electricity you use, the more solar panels you’ll need. Beyond that, your local weather, as well as the size and orientation of your roof all play a part. Figuring out the number of solar panels you need is fairly basic, but there are a few surprising factors that must be taken into account during your calculations. First and foremost, the number of solar panels you install depends on your energy usage. Most homeowners want to produce as much solar electricity as possible, and at least enough to cover 100% of their energy usage. So, for example, if you used 10,800 kWh of electricity last year, you’d want to install enough solar panels to produce 10,800 kWh per year. Every solar panel is rated to produce a certain amount of electricity — measured in watts — at any given instance. This is known as the solar panel’s ‘nominal power’ and most residential solar panels have a nominal power rating of 270 watts. This means that if the sun is shining and you have perfect weather, in one hour that panel would produce 270 watt-hours of electricity (equal to .27 kilowatt-hours). Find out how much electricity you used in the last 12 months. The is the most basic, cornerstone piece of information you need to size your solar installation. Tip: Your utility bill should tell you exactly how much electricity you’ve used in each of the last 12 months. Find your installation size. Head over to the National Renewable Energy Lab’s free online calculator PVWatts to calculate how big your solar installation needs to be to cover 100% of your energy use. How many solar panels do you need? Divide that system size by the size of your individual solar panels. For example, if you needed a 5,700 watt solar installation and wanted to install 270 watt panels, you’d need 22 panels. We’ll look at an example of how to do this, but let’s first look at the components of the solar system and environment, including shading, snow, and temperature that can affect the overall production of your solar installation. Solar Irradiance – Measured in kWh per meter, this is a measure of how strong the sunlight is where the panels will be installed. Sunny Arizona sees about 6.5 kWh of electricity per square meter per day, compared to 3.75 kWh in the state of Washington, so a single solar panel in Arizona will produce much more electricity than the same panel in Washington. Equipment Inefficiency – Inverters, wiring, and wiring junctions aren’t 100% efficient and a small amount of electricity is lost from the moment the electricity is created by the panel to it going to your house for use. All of this typically adds up to about 4.5% in efficiency loss. The age and dirtiness of the panel – As solar panels age or become dirty, they become less efficient. Solar installers take this degradation into account when estimating the total energy production from solar systems. Heat – For every one degree Celsius that the solar panel rises above 65 degrees, it loses 0.4% efficiency. Kind of a lot, right? In fact, all of these small factors decrease the efficiency of the system by about 14% or more! You’re probably wondering how a solar company can take all this into account for each solar system they install. It can be done by hand, with research and lot of know-how, but thankfully, there are now programs like the the PVWatts Calculator that do the hard work for you. Users simply punch in the address and proposed system size and PVWatts looks at local irradiance levels and weather then estimates how much electricity the system will produce. Even with these tools though, calculating your system size can be complicated. You need to know your roof’s orientation and tilt, and how to account for any additional inefficiencies (average snowfall in your area, for example). If you really want to know how many solar panels you need, the best option is to simply contact a few installers for estimates. They’ll be able to look at your roof, energy use, and your needs and give you a much more accurate answer than we could ever provide here. Before you go calculating how much electricity you need, there are a few other considerations that can affect the size of your solar system. The most common reason homeowners aren’t able to cover 100% of their energy use is limitations brought on by their roof – either shading on the roof or the size or orientation of their roof. Even just a small bit of shade on a couple of panels can drastically decrease your overall production. You would think that if 20% of your panels are shaded, you would lose 20% of your production, but unfortunately this isn’t usually the case. Since all the panels are interconnected and most inverters treat the group of panels as one large panel, if there’s shade on just a few panels, production for the entire system can drop dramatically – meaning it’s best to avoid shade where possible. If there’s shading in a small section of the roof, the installer can simply avoid that section of the roof. If there’s a large amount of shading though and you can’t trim or cut the trees down, you’ll likely have to relocate the panels to a different section of the roof – which might be smaller or facing a direction where solar panels won’t produce as much energy. Another common issue that affects the number of solar panels is the orientation of your roof. Here in the United States, the best orientation for solar panels is due south, directly facing the sun, and at a 90 degree angle to the sun. As you move further away from south (facing east or west), energy production decreases. Generally speaking, a solar panel facing directly east or directly west will produce about 25% less than a panel facing directly south. Production decreases even more if panels are facing north, since they aren’t hit by direct sunlight, though they’ll still produce electricity via ambient light. Solar companies will install on the north side of the roof if there’s no other options, but generally steer clear of this approach if possible. Three north-facing panels won’t produce nearly as much as 3 south-facing panels – so if there’s no other place to install other than facing north, solar companies must install more panels to make up for that lower production per panel. 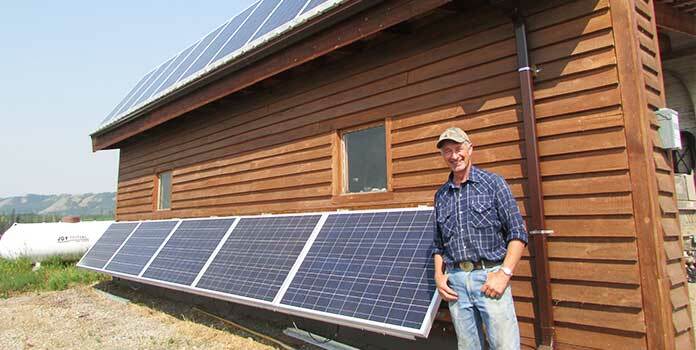 The difference between north and south-facing panels is so drastic that in Oregon, where the state provides financial incentives for going solar, they have a rule that eligible solar installations can’t include north-facing panels. Oregon provides fairly generous financial incentives for going solar, so they want to make sure the money is being used wisely by ensuring that panels are producing as much energy as possible and not limited by their placement. All of this information might be spinning around in your head by now, so let’s clear up with an example. Meet Martha. She lives in Phoenix, Arizona, and wants to install solar. She loves her air conditioning in the summer and uses an average of 1,200 kWh per month, adding up to 14,400 kWh per year. Let’s head over to PVWatts. Her solar installation company sent over a technician to measure her roof and, how perfect, she has a beautiful, shade-free section of south-facing roof! After taking her energy use, location, and all the inefficiencies into account, PVWatts tells us that we find that, in Phoenix, an 8.45 kW system would produce 14,422 kWh annually – right at what we want. With the typical residential solar panel producing around 270 watts, Martha needs 32 solar panels on her roof! Now, let’s say the solar company’s technician found that Martha didn’t have any south-facing roof space available, but her east-facing roof was perfect for solar. How many solar panels would she need then? Heading back over to PVWatts, we find that an 8.45kW installation only produces 12,450 kWh each year – not nearly enough! Instead, we’d need a 9.8 kW system to meet Martha’s energy needs, equal to 37 panels. Can I Cover Over 100% of My Energy Use with Solar? Homeowners often want to know if they can produce more electricity than they use. Maybe they want to increase their savings through a net metering agreement, or are about to have children, or want to put in a pool. They want to be absolutely positive that their solar system will cover their energy use in the future. Almost all utilities have rules around what percentage of your electricity usage can be offset by the solar panels. For most utilities, its 100%. However, some utilities, like Xcel Energy in Colorado, allow homeowners to offset up to 120% of their energy use! Your installer will know exactly what your utility allows, so ask them what the rules are around system size. Going bigger is really a financial decision that each homeowner needs to individually assess to decide if that makes sense for them. Do the math and compare the higher costs for the additional panels and installation against how much they would get back through net metering or the value of having a larger system. Figuring out how many solar panels you need is a fairly simple process, but there are so many variables to take into account, it can be hard to calculate yourself. When you contact installers for estimates, they’ll always send out a technician or salesperson to take a preliminary assessment of your roof and energy use to give you an estimate on your necessary system size and total cost. Once you decide on your installer and sign the paperwork, they’ll send someone out to take more detailed measurements, notes, and pictures of your roof and energy use to fine-tune your original estimate. Occasionally, new information is found, but usually these don’t deviate too far from your original. So while you can certainly give yourself a rough estimate on how many solar panels you need following the guidelines above, the best option is reaching out to a few installers for an estimate.